Large tree fern, trunk to 1m diameter, densely covered with brown fibrous roots. Widespread and abundant from sheltered gullies indry sclerophyll to rainforest, ranging from sea level to subalpine forest. Mostly absent from extremes of altitude (e.g. Central Plateau) and low rainfall areas. Specks of green appear after 2-4 weeks. These are the young prothalli and during the next 6-12 months they are at risk from overcrowding and pathogens. When the first fronds appear the sporelings can be slowly hardened by gradual removal of the container cover. Great care must be taken to avoid drying out. Prick out sporelings when the second frond appears. Young plants are very slow-growing for the first 2-3 years. D. antarctica produces copious spores (800 million per plant annually) One of a handful of ferns to re-colonise in soils disturbed by logging etc. The pithy material near the top of the trunk was eaten by Aborigines. It is rich in starch and was eaten either raw or cooked. Its trunk is the host for many other plants, over 30 species having been observed using it. Not suitable below powerlines. Sow fresh spores into a pot in a water retaining medium with good drainage. Sterilise medium & containerwith boiling water and sow spores by sprinkling a small amount onto the surface. Cover immediately with clean glass or plastic and leave in a warm area in strong light not direct sunlight. 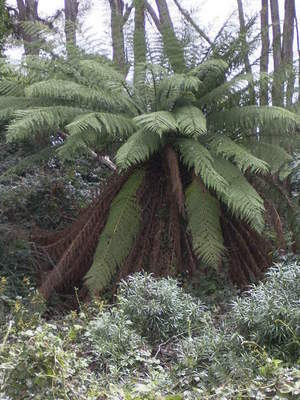 Tree ferns may be grown from trunks sawn off at the base with fronds trimmed from the top. These grow easily when planted in a suitable position and kept moist. New roots are produced from the base and the plants become self supporting after 12 months.If planted during dry periods the trunk should be hosed at least once a day. It is recommended that plants NOT be removed from bush areas for this purpose. Suitable for tub culture.